A 40-minute ride from Paris on local train RER C along the river Seine, where I spotted a much smaller version of the Statue of Liberty, took us to the charming town of Versailles. 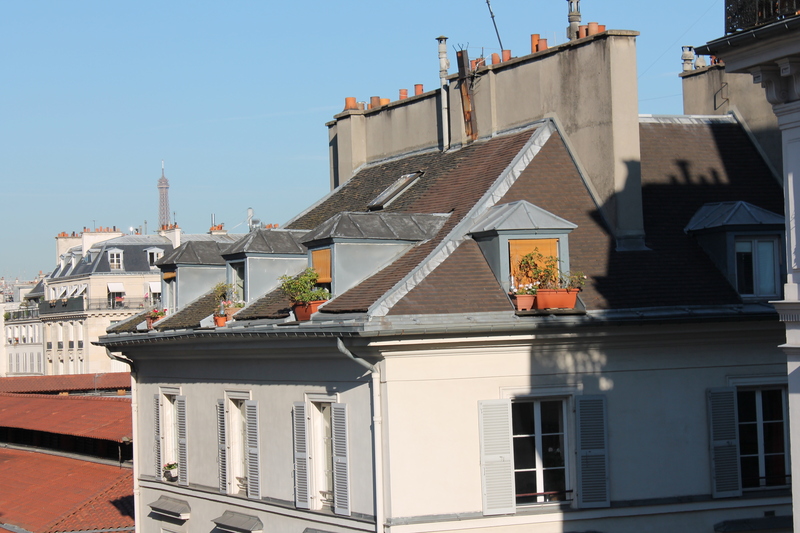 The Versailles Palace is located only a short walk from the metro station Rive Gauche. At first sight from a distance it strikes with its massiveness, huge cobblestone entrance with a gilded gate. It is the biggest palace in the world, and the palace is on UNESCO’s World Heritage List. It was built to its full glory by King Louis XIV known as the King of the Sun, who transferred government from Paris to Versailles. It remained the seat of power until French Revolution in 1789, and it was turned into a museum by Louis-Philippe in 1830. 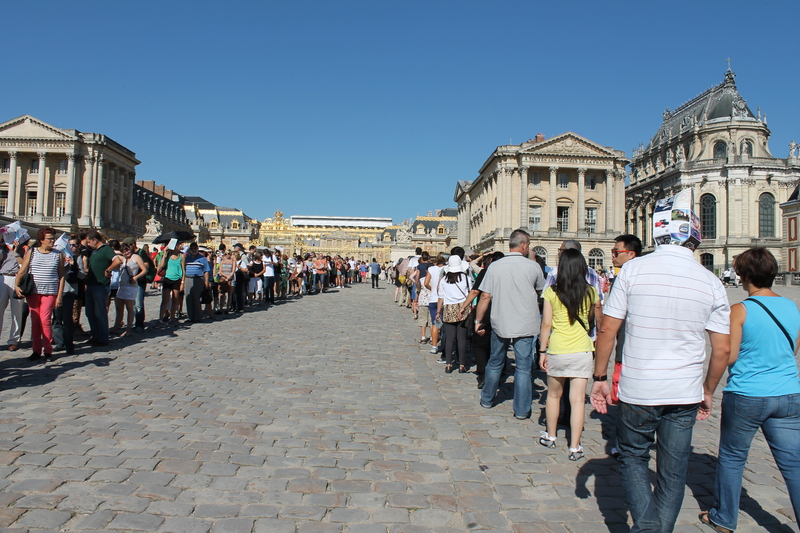 Even with purchased tickets ahead of time, standing in a line to get into the palace is inevitable. For the lover of art, history and literature in me, the tour was a dream come true. Up until the moment I’ve actually wandered through the lavish Grand Apartments of the King and Queen and under the crystal chandeliers, I could only imagine what they looked like. Early on, I’ve read most of the novels by Alexander Dumas about the royals and their intricacies and vices along with the clergy. I loved his novels “Queen’s Necklace” and Madame Dubarry, the Black Tulip, the Man in the Iron Mask and the Three Musketeers. Well, here it was all at my fingertips. My imagination did not lie and I give all the credit to Mr. Dumas’ descriptive and devilish talent. The artwork on the walls and ceilings gives the palace chambers a certain characterization, a definite idea of what King Louis XIV was like; an avid lover of beauty, a passionate hunter and an equestrian, a skilled politician. The Hall of Mirrors inside Versailles. 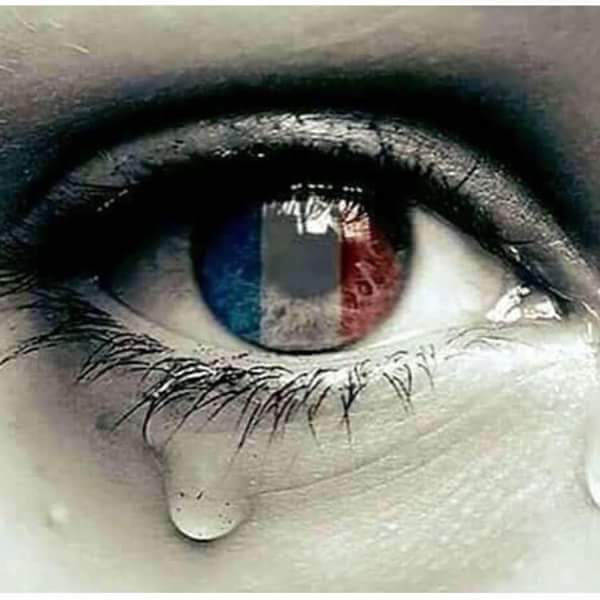 “He put France into deficit, I remember that from history class,” my daughter Emma whispered into my ear. “Yeah, but look how much money the visitors bring in to France now to see King Louis’ palace,” I said laughing. Every day except for Monday, when the palace is closed, there is a steady stream of visitors and an entire flotilla of tour buses. The palace is still used by the French government to welcome official guests. Many rooms are available to rent for different occasions. 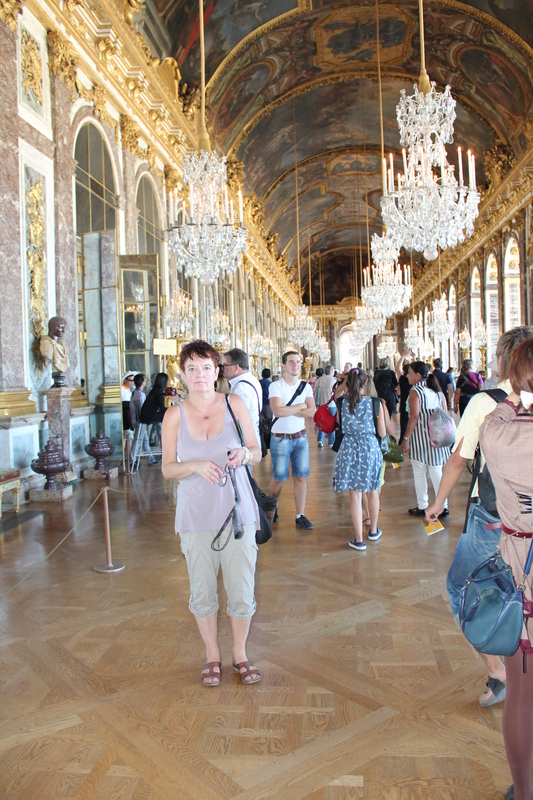 The Hall of Mirrors with crystal chandeliers is the central gallery of the Versailles Palace, and it served much like it does today, as a passageway to other rooms. It is 219 feet long, and a great spot for pictures to savor forever. The tourist guides call it one of the most famous rooms in the world. I also enjoyed King Louis’ meeting room with a very long desk, just like today’s meeting rooms. Crowds lingered behind the railings of the magnificent King and Queen’s bedrooms decked in gilded crimson brocade. So, of course my daughter and I got separated and lost amid all the commotion. It’s famous for Parisian pastries and chocolate, but we didn’t get in because there was a line, and we couldn’t wait. The Versailles grounds, including the Grand Trianon , Maria Antoinette estate, the gardens and parks, stretch 3.5 kilometers from the palace to the west end of the Grand Canal. To fully explore the estate it takes two full days. 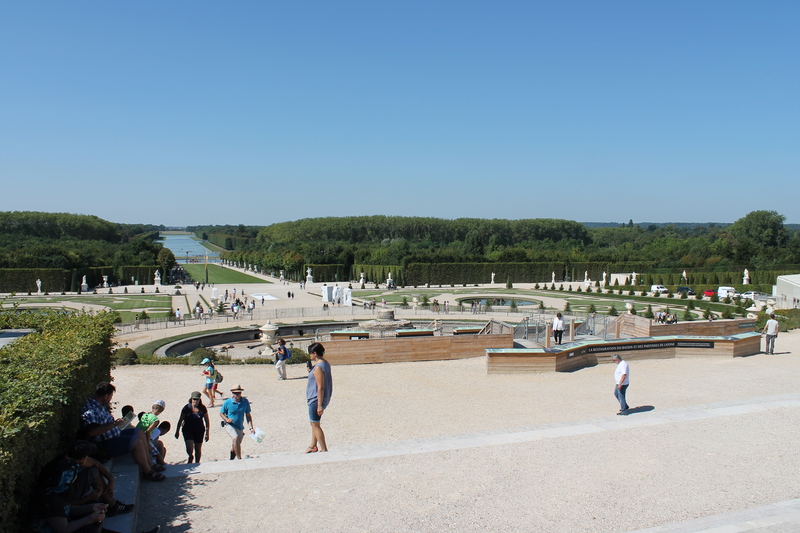 Versailles gardens stretch 3.5 kilometers to the end of the Grand Canal. We chose to walk to the east end of the Grand Canal past the beautiful gardens adorned by statues from Greek mythology. The walkway ends by the Sun God’s Apollo fountain. The grounds can be toured by a mini-train, rented bicycles or golf carts; also available are boat and pony rides. We quenched our thirst at the LaFlotille garden restaurant near Marie Antoinette’s estate. The dessert menu reflected the tastes of the royals and Napoleon Bonaparte after them. So, I ordered elaborate dessert “pear beautiful Helena” in a tall glass with chocolate, ice cream and whipped cream. Drinking water again was an issue, and we had to ask for it twice. As I turned around at the Latona Fountain and water parterre to take the splendor and the magnificence of the gardens in one last time, I made up my mind to come back here. 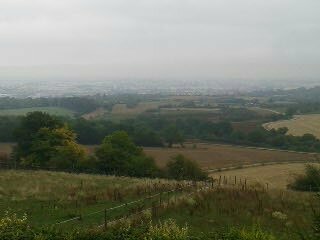 We’re back in Dijon, a city renowned for its mustard and the former seat of the dukes of Burgundy. But, mainly it is in the heart of the Burgundy wine region that produces the best wines in this world. 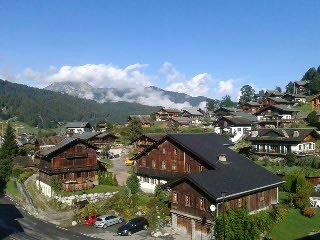 My daughter Emma lives here with her husband Adrien and Ella. We both are avid travelers and we took this unique opportunity to explore and broaden our horizons, and to share this with all our friends. We started out in Paris on Sept.4th after my arrival from the United States. (See my previous post “On the road”) from Sept. 7. 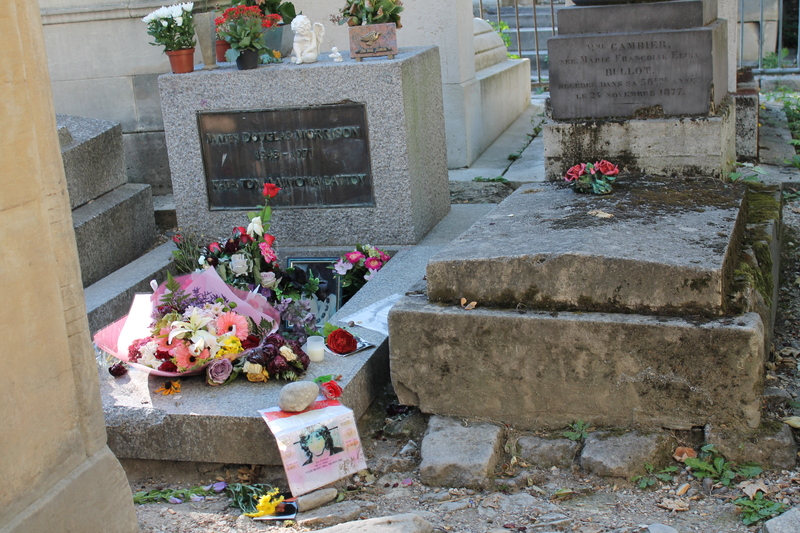 After seeing the Eiffel Tower and the Notre Dame Cathedral in 2009, like many tourists we’ve always wanted to visit the gravesite of singer, song writer, author and poet Jim Morrison, founder of the group The Doors, at the famed Pere Lachaise cemetery. Morrison’s grave is the fourth most visited site after the Eiffel Tower, the Notre Dame Cathedral and the Pompideau Center, states a Paris guide. It’s quite a ways out from the standard Paris tourist path located in the 20th Paris arrondissement near metro station Philippe Auguste. Jim Morrison’s grave at Pere Lachaise in Paris. Walking through the cemetery’s narrow cobblestone streets lined by sepulchers and mini chapels, I realized that this is a true “City of the dead” still operating on 110 acres with more than one million dead bodies. It is more a museum than a cemetery. It even has a square Samuel de Champlain with benches, where people read novels or make notes. Morrison himself visited the cemetery one week before his death on July 2, 1971, and expressed a desire to be buried there. Other graves of the famous include: singer Edith Piaf, playwright Moliere, Honore de Balzac and Frederic Chopin. This is my new cover photo for my author’s page on facebook. It was taken at one of my favorite hangouts Ella’s Coffee & Cuisine in downtown Lowell at 307 E. Main. As an author, I deeply believe in artistic synergy. 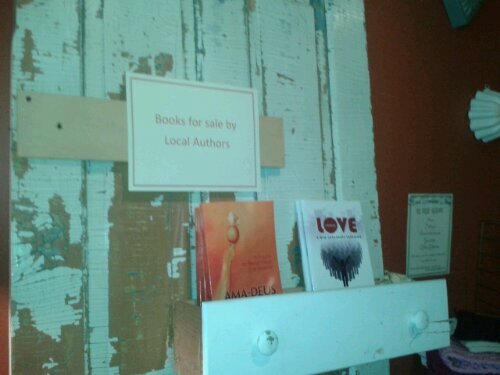 The owners have been supporters of local artists and authors from the very beginning. Ella’s to me is reminiscent of Paris hangouts of authors like Hemingway and his circles. I feed my artistic energy from other artists’ work as well. I invite all to like my on my author’s page. It is here where I post snippets of my upcoming work and happenings.